I hope you enjoyed your Easter Holiday. I had a wonderful experience on Easter morning. After many years of planning to build a new church. We held our first service in our new building on Easter Sunday 2012. What a wonderful feeling to have dreamed a dream and see the dream come true. It was a truly an amazing morning. Later in the afternoon Sweetheart and I watched the 'Masters' golf and had our daughter and granddaughters over for a wonderful dinner. It was just a perfect day. I have so much to be grateful for, and I try to remember it everyday. The weather is very unpredictable this week. It will rain and sunshine within one hour. I am ready to have a cup of tea. I was so excited after I saw the little 'Jug Cover' at Lisa's Tea Room I came home and found a doily and sewed some beads on the tips. I just think it's the cutest accoutrement . My vintage bird cage adds so much romance to my Lilac Tea. The birds and I are singing all about Spring. I have not grown a Lilac bush before, and I was so surprised when I put the flowers up to my nose and the beautiful fragrance hit me. Wow... The scent is so sweet and delicious. My Great-Grandmother's silver tea leaf spoon. Perfect for a cup of tea. It is so magical to have flowers in the garden. The joy of picking them, and arranging the bouquet. I have never had a flower bouquet look the same. I would like to thank you for visiting My Cozy Corner. I hope you found something interesting or inspirational. I'm joining some great parties so come along and see the beauty of blogland. Your table setting is completely sweet. It was so calming to look at such beautiful photos. The lilac is gorgeous too, it's something I have never tried to grow. Might have to look into doing so. Thanks for sharing. An enchanting tea table and I'm glad you brought your beautiful lilacs in for it. Congratulations on your new church opening. What a lovely lilac tea! I love lilacs, but I can't grow them here and I miss them. Your birdcage is so pretty and the Haviland china is gorgeous. Well done on the jar cover. It is exciting when a dream comes true and how wonderful to celebrate on Easter Sunday. Happy Spring! Happy Easter! Happy Tea Day! This is so pretty. The Lilacs are georgous...mine are just starting to bloom, but not quite enough yet for a bouquet. A lovely, lovely table. A lovely lilac tea indeed! We used to have them along the side of a house in the mountains, in purple and white. The white bloomed first I think, but I loved the purple best. What a lovely scent! Your setting is so pretty. Love the Haviland. So glad your Easter service was a blessing! Thanks for sharing and linking to Tuesday Cuppa Tea! 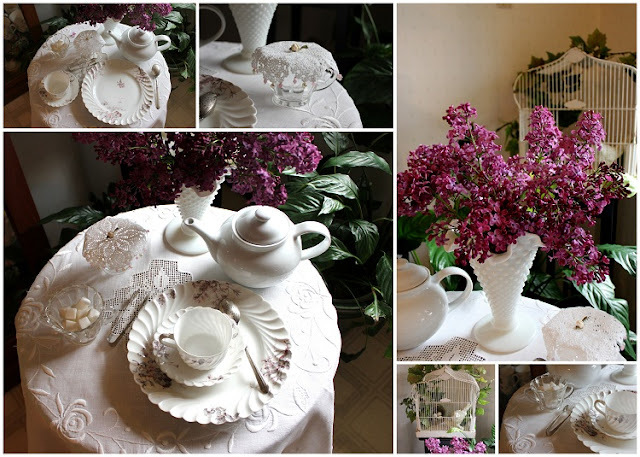 The lilacs, the bird cage, the china, and that lovely tablecloth...everything is so perfect!...loved it all! it must have been a very spiritual and special sunday for you all to held the first service in the new opened church on Easter. I cannot imagine a better day to to consecrate a church. And the lilac tea table is wonderful. How generous to cut all your flowers for this tea. But your lilac bush will love that, as it start immediately after the cut to prepare the flowers for the next year. Thank you for sharing this joy and the wonderful tea table. Congratulations on the new church. What an accomplishment! Your lilac tea is lovely. A perfect moment for one. How exciting to have your first Easter service in the new church! What a beautiful service it must have been. I simply love your tea table! The lilacs are gorgeous and I can almost smell them through the computer! I like your little 'jug cover,' really sweet! Your china and silver spoon are just lovely! And I always love to see a birdcage. I so enjoyed my visit with you, Betty! Thank you for sharing and have a delightful week. What a beautiful lilac tea you prepared! I've enjoyed this post so much. Thank you for sharing. Your tea vignette is gorgeous. Every attention to detail delights the eyes. What a lovely tea event - and the smell must be heavenly! Hi Betty, Your lilacs are a stunning color. Pretty china too. I really enjoyed your post today. This post is so lovely. I can almost smell the lilacs! This is the first time I've visited your blog and it's very nice. [I found you through Bernideen's Tea Time blog.] I smiled when I read that you held the first service in your new church on Easter Sunday. I hope I'll be able to write about our first service in our new church before too long. We are a new church plant [eight years old] and meet in an elementary school. We have purchased our property and are having architect drawings done now. I love the smell of lilacs, and yours are beautiful. Your tablescape is charming...china, doily coverlet, everything!